If your experience with raw soups begins and ends with gazpacho, let us just say you have an entire world of deliciousness and nourishment to explore this summer. Not only are raw soups quick to make (since they require zero cooking), they make a great summer meal option while the body naturally craves more hydration and lighter fare. They can also be done in so many different variations whether that's sweet or savory, mildly flavored or extra spicy. 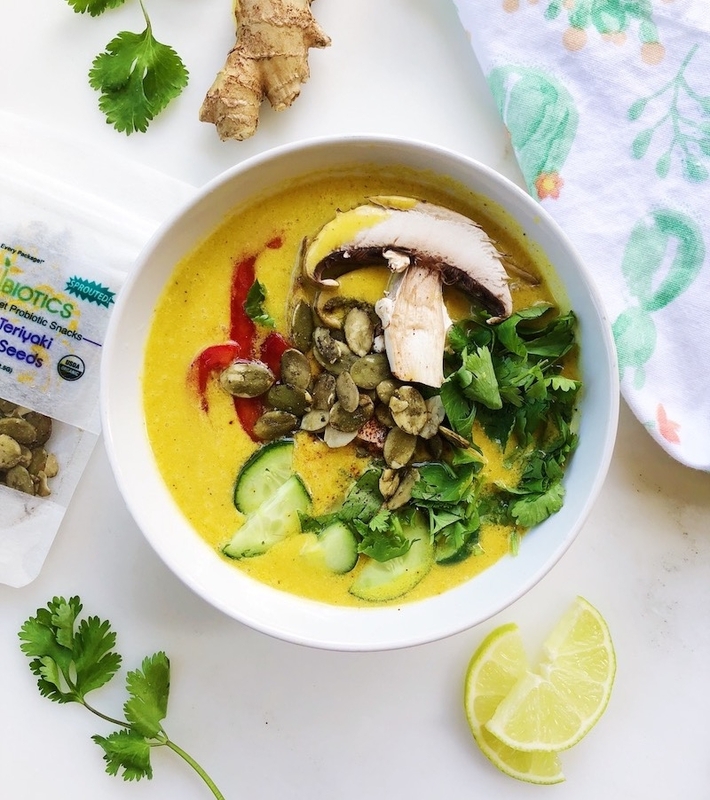 This recipe takes its inspiration from a classic Thai coconut soup and contains all the right flavors to light those taste buds up: sweet, sour and salty with just the right amount of heat from ginger and hot pepper. Plus cilantro, lots of lots of cilantro, which aside from being delicious when paired with the flavors of coconut, turmeric, and ginger, is also highly detoxifying – making it a great addition to a summer cleanse. 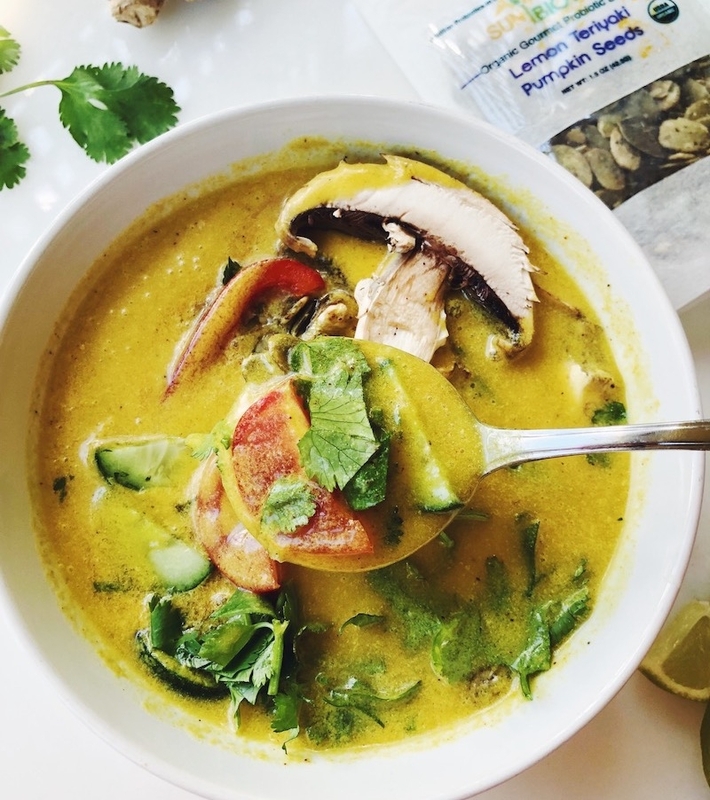 The base of this soup is a fresh Thai coconut – the ones with the white husks - which you can find in many health food stores, Whole Foods, or if you live near an Asian market with fresh produce, be sure check there! The soft coconut meat blended with the fresh coconut water makes a creamy soup base with a subtle sweetness. Not sure how to crack open a coconut without risking serious injury? It's actually easier than it looks – but before grabbing the nearest machete and jumping in there, be sure to watch a video like this one here. 1. Make your soup base by blending your ingredients together until smooth. If using lemongrass oil blend that in last for the best flavor experience. 2. Pour creamy soup based in a large bowl, and add your chopped vegetables. Veggies are up to you - use what you love and have on hand. Garnish with a sprinkling of Sunbiotics Probiotic Enhanced Pumpkin Seeds and enjoy!